All Products > "125001050 Ansmann Big Bore Front Damper Pair"
These 1/10 Big Bore shocks by Ansmann are a great upgrade for Ansmann's 1/10 buggy range and virtually all other 1/10 buggies. They'll fit on the Mad Rat, X Pro, Blizzard and X4 Pro. The kit contains all of the shock components, all you need is oil. Featuring high quality machined aluminium parts throughout the shock, they'll add durability as well as the bling factor to your model. 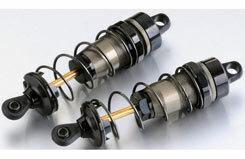 In addition to those features, Big Bore shocks offer better consistency whilst racing. In smaller shocks, the lower volume of oil gets warmer quickly and can give you an inconsistent shock, essentially the shock changes during a race. With Big Bores, the shocks contain more oil therefore stay more consistent throughout a race, they also offer superior handling on bumpy surfaces.